Eyebrows are tricky little creatures. They come in all shapes, sizes, and colors. We tweeze them, pluck them, thread them, shave them, and draw them on all trying to achieve the perfect brow look. I’ve always had the misfortune of one brow turning out great while the other is crooked. As a busy mom, I just don’t have time to redo my eyebrows over and over. And when I’m playing with my kids, I’ve had my eyebrows rub off, which can be quite the sight! When I heard about permanent costmetic procedures, I was really skeptical. What if it hurts? What if it doesn’t look good? What if I’m stuck with something I hate? During my time working in health care, I met several fun older ladies, in their 80’s and 90’s who had permanent makeup tattooed on. As they aged, their facial features moved around and the tattooed makeup wasn’t in the correct places. So with all of this in mind, when Taby contacted me and offered me to come into her studio and get a procedure of my choice, I was hesitant. I agreed to come in for a consultation to learn more about what she does and how it could work for someone like me. During the consultation, I learned that her procedures are done through a method called Soft Tap, a semi-permanent method that scratches the skin differently than a full on tattoo, so technically it’s not a tattoo. Also different is the length of time that it will last for. Permanent cosmetics procedures last an average of 3-5 years. This alleviated my concerns for my 80 year old self having crooked brows. I decided to go ahead and move forward with the procedure. Along with brows, Taby offers all types of permanent cosmetics including lips, eyeliner, beauty marks, and more! I chose eyebrows because it made the most sense for me. I thought it would be amazing to have good brow days every day, on both of them instead of just one….and never have to worry about them rubbing off. I worked with Taby to select the perfect shade and shape. What I found to be most impressive is that before the procedure, the shape of my brows was kinda blah. Taby was able to create the exact shape I wanted (I showed her a photo from Pinterest) and now I am blessed with nicely arched brows that fit my face perfectly! At the beginning of my appointment, I met with Taby to go over color and shape options, sign paperwork, and receive an understanding of what to expect during my procedure. The initial procedure lasted for about 2 hours: 1 hour for each brow. While I previously used an eyebrow razor, I had expected the sensation to feel similar. It was much, much different. I will, of course, preface this to say that I have a very LOW, or really non-existant, tolerance to pain, so my experience is not typical. I have endometriosis and suffer from chronic pain daily so I’ve found that any additional pain is worse than average for me. That being said, the procedure was quite painful. Taby did a great job of addressing my concerns and applying numbing gel throughout the procedure to the sensitive area. I found the numbing gel to dull the pain about 5% so it wasn’t significant. It was important to also note that I was not able to take any pain medication before, during, and within 24-48 hours after the procedure because of blood thinning. It needed to clot in order to heal properly. Immediately after the procedure my brows were sore. I was told to drink lots of water to help the healing process along, which I did. I rested the first day, which really the average person wouldn’t need to do, but I’m a huge baby about pain. The following day, they were tender to touch but otherwise no issues. I was given a healing gel to apply to my brows every 2-3 hours immediately following the procedure and throughout the week. It took about 7 days to heal. During the healing process, there were scabs on the eyebrows that eventually came off, but nothing too bad. The color is also much darker immediately after the procedure and will fade up to 40%. So the initial color is not the way they will end up. After 6 weeks, I went in for a touch up procedure to correct any imperfections and go over the brows a few more times for the final color. The second procedure was a bit more painful due to new, sensitive skin, but also easier knowing what to expect. Taby did a great job and was very patient with my pain tolerance.Since my eyes watered so much during the first procedure, I came to my touch-up appointment without any eye makeup, which made things a lot easier. I just completed my 7 days of healing and I am SO happy with the way they turned out! I’ve gotten many compliments and although I found it to be painful, I would definitely recommend this procedure to others! I’m glad it’s over, but I’m very glad I was brave enough to do it and now I have amazing brows every day! 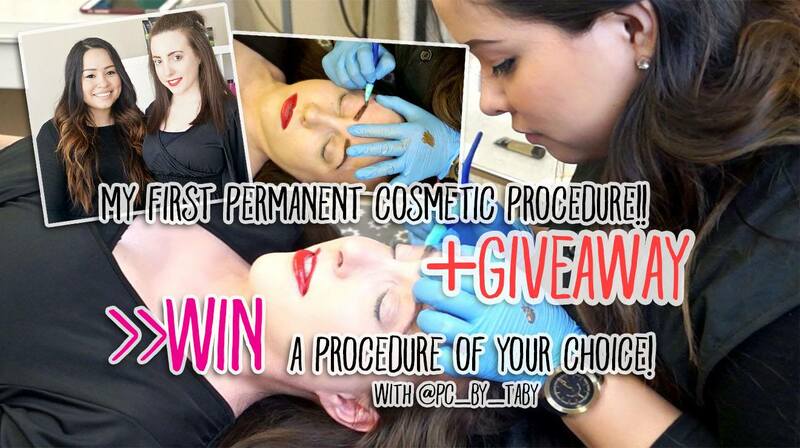 WIN A PERMANENT COSMETIC PROCEDURE WITH TABY! Overall, Taby is great to work with, very good at what she does and highly professional. I’m really glad I trusted her to perform this permanent cosmetic procedure! I’m partnering with her to offer one of my lucky readers a complimentary permanent cosmetic procedure of their choice, valued at around $350! The only catch is that you’ll have to have your procedure done in Provo, Utah and be available for your 6 week touch up as well. So while the contest is open to anyone, keep that in mind so that the winner is able to claim this amazing prize! To enter, follow the directions below. The giveaway will take place on Instgram and you must be 18 or older to participate! STEP 1: FOLLOW ME @paperclipsandpacis AND TABY @pc_by_taby on Instagram! Step 2: Like the giveaway photo on my account. Step 3: Tag a friend in the comments for bonus entries. Only one tag per comment! No limit to bonus entries! The contest will be open until August 12th at 5:00PM MST. We will verify all entries and a winner will be announced shortly after. You will have 6 months to schedule your consultation with Taby after which it will expire. Have you considered a permanent cosmetics procedure? Previous post [Spotlight] Meet Ushy the Sock Monster! Wow, I didn’t even realize you could get permanent eyebrows, but how awesome! Definitely saves the time and effort in filling them in every day. Was the recovery time pretty quick in your opinion? [Spotlight] Meet Ushy the Sock Monster!